I always love trying something new! It's one thing to try something new that catches my eye, and entirely another to make something new that is suggested by others. This challenge is what led me to join the Daring Bakers years ago! The Daring Bakers is a group of people across the world, united by the internet and a desire to come together for a monthly dessert challenge. Each month, a different member comes forward and challenges the group to make something new, unusual, difficult or in some way "a challenge." This month's Sans Rival perfectly embodies the spirit of the Daring Bakers. The Sans Rival translated means "without rival." This gluten-free cake has its origins in France, but is one of the most popular desserts in the Philippines. In the 1920s and 30s there were many Filipinos who went abroad to study. Many went to France and, while there, learned French cooking techniques which they then brought home. A Sans Rival is made with layers of dacquoise, which is a baked meringue that incorporates finely crushed nuts. There is no flour in the cake, with the nuts completely taking the place of flour. The recipe typically uses crushed cashews, and is layered with a rich, French buttercream. This cake nicely pairs the two, with the silkiness of the buttercream complimenting the nutty crunch of the dacquoise cake layers. The first new technique in this dessert is the making of the meringue. This meringue is not cooked using a sugar syrup (like an Italian meringue) or by combining over a hot double-boiler (like a Swiss meringue). This meringue is sometimes referred to as a "classic" or a French meringue. The technique is to whip egg whites in a clean bowl (sometimes with a pinch of cream of tartar), and then add sugar to the egg whites, bit by bit, until incorporated. 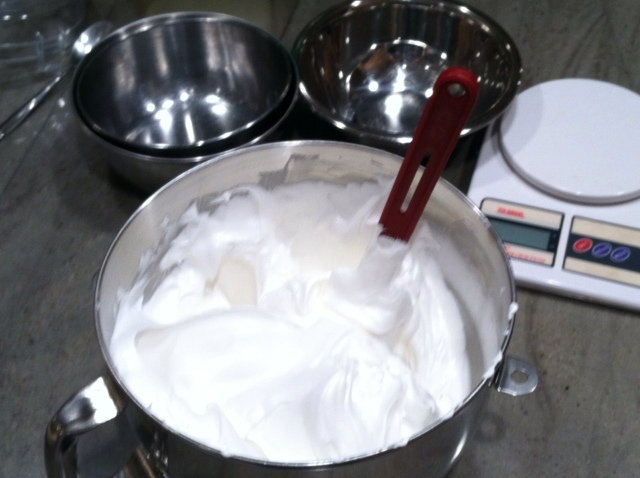 A thick, glossy meringue will result. The finished dacquoise are layered with a French buttercream. A French buttercream uses egg yolks (not whites like an Italian buttercream) cooked with a sugar syrup and then combined with butter. 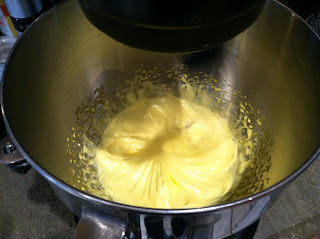 The resulting buttercream is really rich and really silky smooth. As you can tell, this one is a diet buster. Preheat oven to 325°F and prepare cake pans (if using) by spraying or buttering, then lining the bottom with a round of parchment paper. Well flour the sides. 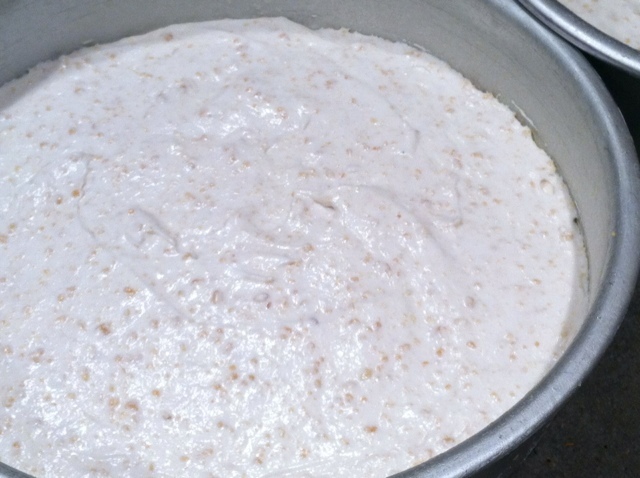 In a large, clean bowl, beat egg whites on medium until foamy, about 2 minutes. Add in the cream of tartar. Increase speed to high and gradually add sugar, continuing to beat until stiff shiny peaks form (about 7-10 minutes). Fold in the chopped cashews, being careful not to deflate the batter. Pipe the batter into 4 equal size cake pans. (If you only have 2 pans, save half the batter, bake the first batch, then clean and freshly grease/line/flour pans before baking the 2nd batch.) Bake for 30 minutes until golden brown. Immediately turn cakes out and remove parchment paper from the bottom. Allow to cool. Cake layers can be wrapped and frozen until ready to use. Beat yolks at high speed in a stand mixer until they have doubled in volume and are a lemon yellow color. Put the sugar and water in a saucepan and cook over medium heat to 235°F. With the mixer on high, slowly add the syrup to the whipping yolks, pouring carefully down the sides of the bowl. Be careful not to let the hot syrup burn you if it flings off the whisk. Continue beating on high until the mixture is room temperature. Still on high, beat in the butter one tablespoon at a time, then add vanilla. If you refrigerate the buttercream before you use it, be sure to whip it up just before using. A diet-buster is right, but delicious all the same. I'm curious to know what your finished cake looked like! It was certainly wonderful. I think I had two pieces too many!